There is nothing that says spring than fresh vegetables and what better way to welcome spring than a huge bowl of Pasta Primavera which simply means pasta with vegetables. From Essential Pasta Cookbook , this is what we had one night when The Clone was again begging for her favorite spaghetti. Since she was the one who chose the cookbook, I told her to look through it and choose another pasta dish to cook and she picked this one that had lots of vegetables in it. Great choice! 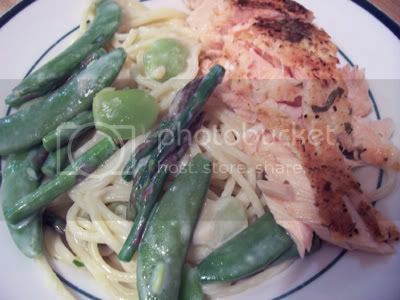 She had a big bowl of pasta and vegetables and we who eat fish, paired it up with a nicely baked salmon. We altered the recipe slightly to fit what we had in our refrigerator. Other vegetables suggested in the recipe were celery and peas which we didn’t have at the time but we did have some skinny asparagus, frozen broad beans and some sugar peas. Boil a pot of water and cook the pasta until al dente or about ten minutes. 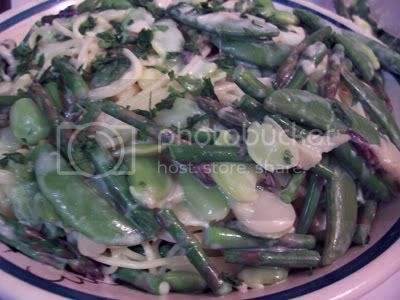 While the pasta is cooking, melt the butter in a heavy bottomed pan and add asparagus and sugar snap peas. Stir for a couple of minutes until the vegetables turn bright green. Add the cream and gently (medium low heat) bring to a boil. Add the broad beans and parmesan cheese. Season with salt & pepper then add the pasta. Mix/toss together. Add some of the pasta water if it seems too dry. Adjust the seasonings and serve with additional grated parmesan on top.